One of the largest factors we consider is just how many animals are inhabiting your home. The smaller the infestation, naturally, the lower the price will be. We always recommend acting right away if you suspect that there are critters living in your attic because of the damage they can do, and how quickly they reproduce. The type of animal also has an impact on price, as the techniques needed to remove them varies depending on the critter we’re dealing with. During our inspection of your home, we always try to determine what condition the animals are in. Determining whether or not the animals are healthy, injured, or dead is important to determining the cost of removal, as the techniques for removal and amount of risk changes with the animal’s condition. If there are animals holed up in an area that is difficult to reach, additional tools and time may be required for removal, which will impact cost. The same goes for adverse or extreme weather conditions that may affect a technician’s ability to complete their job efficiently. Though we cannot give accurate pricing without first inspecting your property, our clients generally pay between $100 and $300 for their animal removal needs. 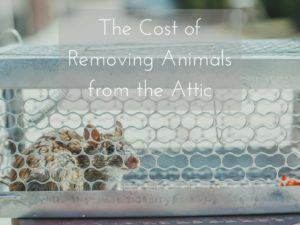 To keep damages and costs to a minimum, do not wait to take action if you suspect that there are animals in your attic. Give Critter Control® of Fort Worth a call today at 469-805-6267 to schedule your home consultation.